is the area between 2 concentric circles. Input begins with an integer T (about 25), the number of test cases. the area between the circles centered at (0,0) with radii r and R.
The next line of input contains an integer N (0<=N<=500), the number of cones. integers, and are guaranteed to lie within the track, and be distinct. Cases are separated by a blank line. can navigate the course, rounded to 3 decimal places. The image below shows the course corresponding to the sample input. 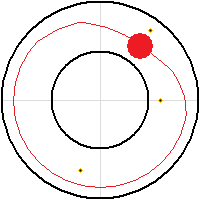 The black circles represent the boundaries of the racetrack, the small dots the cones, and the filled red circle the car. Also shown is one possible path of the car through the course.